The opposition rally in Moscow on March 10 is yet another act of media warfare against Vladimir Putin’s resounding victory in the election, and the opposition and Western media are aiming to undermine Putin’s legitimacy believes writer Igor Panarin. The media campaign against Vladimir Putin has failed to accomplish the main objective for its Stage One, which was to take Russia’s presidential election to a second round. Mr. Putin scored around 64 per cent of the vote, which is even more than what the Russian Public Opinion Research Center had predicted prior to the election. This is probably one of the reasons you could see tears in Putin’s eyes during the rally in his support, which took place in Manezhnaya Square on the night of March 4 and attracted some 110,000 people: these were tears of happiness over such a convincing victory. You have to consider the enormous pressure he was exposed to throughout the campaign and during the vote count, both internationally (the crisis in Syria) and domestically (street protests of the opposition backed by Mikhail Gorbachev and Michael McFaul, and virulent campaigning in the Internet, which the pro-Putin party had completely lost). However, the surge in protest activity following the parliamentary election last December only boosted Putin’s vote total in the long run, as it urged all the sane and patriotic-minded Russians to show up for the election in order to counter the threat. I myself went to vote around 12:30 pm on March 4. The voting procedure was excellently organized. Everything was calm and orderly, and the police guarding the polling station performed smoothly and were polite. There were public observers present. I even had to wait in line a little, with six other people casting their ballots ahead of me. There were generally many more people at the station than at any other election previously, which means voter turnout was high this time. There was generally an air of balance and reason at the polling station. Voters were very diverse in terms of age, ranging from students to senior citizens. As I was leaving to go home, there was a flow of people heading in the opposite direction – something I have not seen for a long time in Moscow. If we were to imagine the average pro-Putin voter, it would primarily be a sober-minded conservative who believes Russia needs a strong government. In this sense, Putin’s supporters are somewhat similar to those of Communist Party leader Gennady Zyuganov. 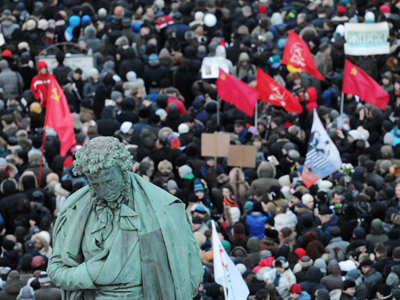 Most pro-Putin voters are workers united in trade unions. Naturally, there are also the military, the secret services and the defense industry. Even though there have been some very impressive decisions made with regard to pensioners, the elderly demographic was dispersed among Putin, Zyuganov and the leader of the Fair Russia Party, Sergey Mironov. As for the supporters of Mikhail Prokhorov, they are mostly people aged between 20 and 40, successful professionals who look forward to realizing their full potential. But I am sure there is something they do not realize, namely, that if Russia were to have a weak government, they would soon be disappointed. I believe Vladimir Putin is the only possible leader capable of managing a smooth transition to a Eurasian Union in a situation where the European Union has all but collapsed. The world needs an economic powerhouse that would be stable and reliable, and that is what Russia should become. This would bring more investment to the Russian economy, which would essentially enable us to drastically improve our quality of life. Putin’s biggest problem is the fact that no one bothers to explain this rationale. Therefore, the area of PR and ideology is where we are failing, since no one in particular is in charge of it. That is why Russia needs to introduce a state ideology (Spirituality, Greatness, Dignity). I think the only way Vladimir Putin will be able to complete his presidential term is by introducing such a notion to the Russian Constitution following a comprehensive, nationwide public discussion. Also required are media support and public awareness efforts to back a future Eurasian Union and its integration vehicles. Meanwhile, the recent opposition rally of March 5 marked a new stage in media warfare against Russia. By inciting unrest in Moscow’s Pushkinskaya Square, the opposition has embraced the tactics of provocation. Notably, the signal for such a transition came from London. The Guardian announced “a battle to unfold in the next 24 hours” as early as the morning of March 5, essentially proving my point about deliberate interference in Russian affairs on the part of Great Britain. The new objective of the media campaign against Russia, including the rally on March 10, is to undermine Putin’s legitimacy and force him to resign, with the ultimate goal of destroying Russian statehood. The nearest deadline is supposedly August 2014. Vladimir Putin’s deposition would mean turmoil for Russia. He is the only political personality in today’s Russia capable of accomplishing economic integration across Eurasia, making Russia a global center of gravity in political and economic terms. However, to that end Mr. Putin would need to respond to certain challenges and get rid of some dead weight among his entourage. In fact, the recent protests were largely aimed against a certain personnel policy rather than Putin personally. What irritates people is the fact that certain ministries or state-owned companies are headed by incompetent and unprofessional executives who keep their offices merely thanks to being close to Vladimir Putin. Thus, I believe, there are attempts at destabilizing Russia being orchestrated from abroad. Their purpose is to weaken Putin’s standing as much as possible, ideally removing him from power, with the ultimate goal of preventing further integration in Eurasia. With that in mind, Russia urgently needs an efficient system of media defense which would include both state-owned and private assets, to protect the legitimacy of the Russian president.